If you love the classic Hong Kong hot pot dish, stewed brisket with Chu Hou paste (柱侯牛腩) like me, you will like this braised chicken wings. The taste of Chu Hou paste goes really well with the chicken wings. It’s wonderfully delicious. The wings and the sauce were gone faster than I thought. This dish is so perfect for big fans of rice like my family. Rinse the chicken wings. Wipe dry. Chop into bite-sized chunks. Mix with marinade well. Set aside for 20 minutes. Heat oil in a wok or frying pan. Saute onion until translucent. Push to the sides of wok. Add some oil in the middle. Saute shallot and garlic. Add Chu Hou paste and stir to combine until aromatic. Toss in the chicken wings. Cook until both sides turn lightly brown. Pour in the water. Cover and cook for about 3 minutes, or until 90% done. Add capsicum and stir fry until it turns soft a bit, still remains crisp. Stir in spring onion. Done. Serve immediately. The power of every stove is very different, so adjust the amount of water accordingly. Add water bit by bit if needed. Don’t pour too much in one go as you don’t want to dilute the sauce. When the dish is cooked, it should have some sauce but not too watery. Good morning Christine, your braised chicken looks delicious. 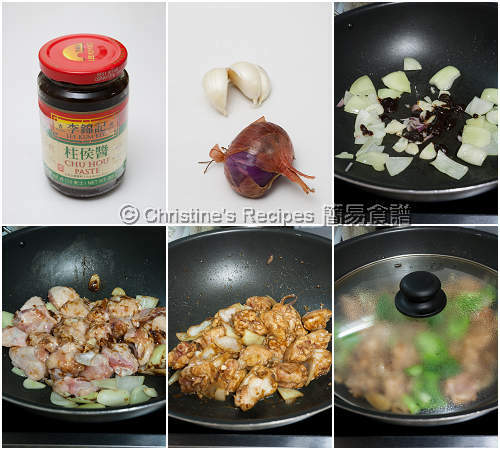 I often used Chu Hou paste in braised beef but not in chicken. I should try the next time. Thanks for sharing. A quick and delicious stir-fry. I like chu hou sauce too. I really want to try this dish, but couldn't find shaoxing wine, but I found "black glutinous rice wine" from the Asian market. Are they the same? Thanks! 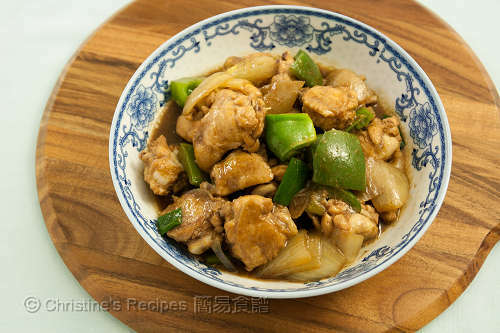 If you don't have shaoxing wine, replace with white rice cooking wine then. What ingredients can I replace with as my boys dun like onion and capsium. Thank you. The onion and capsicum are the veggies to balance the dish. If your family doesn't like them, you can replace with some other veggies they like, or simply skip them. 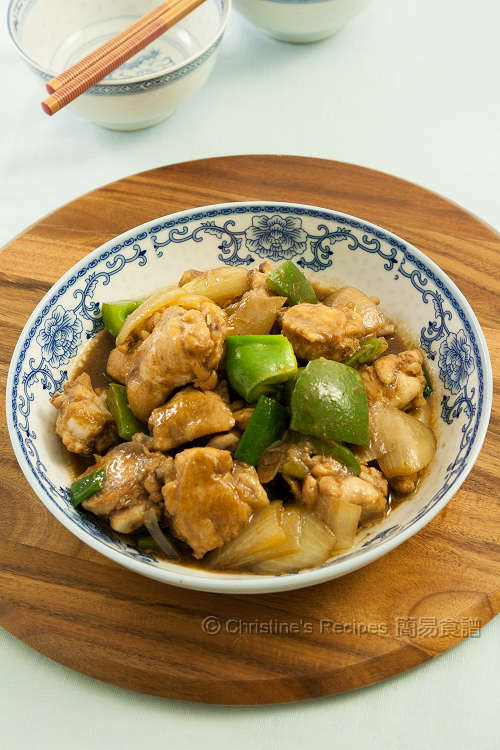 Hi Christine, I have tried the dish with the capsicum and its fantastic...although they dun take eat the capsicum but it really give a fragrance and balance taste to the dish... I shall try with the drumstick meat in the next round... Thank you Christine..
Hi Christine. I happen to have some chicken wings with bones and cannot be chopped. Do I still use same measurement?